Montana Canvas Wall Tents: The best and only hunt camp tent you'll ever need. 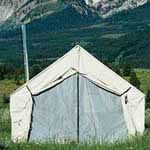 Wall tents are in stock at Outfitters Supply™ and ready to ship. Our stock wall tents by Montana Canvas are available in a wide variety of sizes and materials, and we invite you to completely customize your wall tent. A customized wall tent will typically take 2-3 weeks to build and ship, but we encourage you to call for a time quote, especially late in the summer before hunting season. The Wall Tent, also referred to as a cabin tent, has a history and a legacy as old as the country. It provided shelter from the most severe elements for our early pioneers, trappers, miners and hunters. The legacy continues today, as it is the most comfortable way to introduce children and adults to the outdoors for a quality outdoor experience. Stove jack with a weather flap in your choice of 4”, 5” or 6” opening. This stove jack is designed to withstand the extremely high temperatures associated with the use of a single wall stove pipe in a wall tent. Standard placement of the stove jack is inside the front door on the left. Full length ridge pole reinforcement with additional reinforcement at the gable ends. Eaves constructed of a double layer of canvas, double layer of heavy duty reinforced vinyl and ¼” rope. Endwall seams using six layers of canvas, double locked stitched. Walls are full five feet in height. Doors are 7’6” and secured by a heavy duty, trouble-free YKK zipper with a generous weather flap that is secured by Fastex side release buckles. The bottom of the wall tent is reinforced with webbing and uses grommets instead of sewn-in stake loops to allow you to stake your wall tent from the inside or outside. The sod cloth that attaches to the wall tent bottom extends a generous 12” beyond the tent floor to provide a weather-tight seal. Compatible with any terrain and weather condition, the sod cloth can be folded inside or extended outside the assembled wall tent. Instructions for constructing a lodge pole frame. A video that shows you how to set up and care for your wall tent. All wall tents are treated with flame retardant, water and mildew resistors and meet California Fire Marshall requirements. Would you like to go shopping?